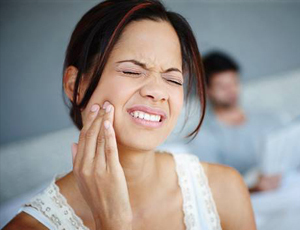 Dental injuries and severe oral pain can strike at any time, and often when it’s very inconvenient. At Premier Dental Care, our patients can rely on us to make time for them in emergency situations. Please contact us right away for assistance, either over the phone and in-person. Dr. Bakhtyari will review your condition, provide immediate relief, and help you determine the next steps towards rebuilding your smile’s function and appearance. Dr. Bakhtyari and his team are always here in case you have a dental emergency. However, rather than treat an emergency, we’d much rather prevent one from happening in the first place. So let’s discuss a few steps you can take to protect your smile. 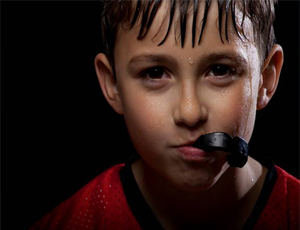 The most important thing you and family members can do to avoid dental emergencies is wear a mouthguard during any type of athletic activity. A large number of dental emergencies in Herndon happen during play to someone not wearing a mouthguard. Today, these oral appliances are more comfortable than ever so there’s no reason not to wear one during play or practice. The second step is sticking to a schedule of regular dental checkups every six months. During these visits, Dr. Bakhtyari will examine your teeth, looking for developing problems such as a cracked tooth or infection that is only visible on an X-ray. Treating these issues sooner rather than later can fend off an emergency and is likely to cost less than urgent care. Stop the Bleeding. As with a medical emergency, the first step is to stop or slow the bleeding. Use a clean cloth or gauze pad to apply firm but gentle pressure to the site. If bleeding doesn’t slow down within 10 minutes, then head for the nearest emergency room. Handle with Care. If you’ve suffered a knocked out tooth, try to touch only the crown; touching the root might harm tissue that is still attached. Gently rinse the tooth with water. Then, try to place the tooth back in its socket. If this isn’t possible, hold it in your cheek or under your tongue. Finally, the tooth can be sealed in a container or plastic bag filled with milk. Be Gentle. 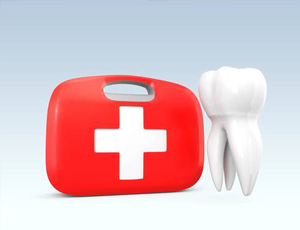 If your emergency is a dislodged tooth, then don’t try to force the tooth back into its proper position. This could further loosen the tooth. In case of a foreign object or a large particle of food trapped between two teeth or along the gum line try flossing. If this doesn’t work, never use anything sharp or pointed as a tool to remove something in your mouth.